Obituary for Jean Marie Klebetz | Wyman-Fisher Funeral Home Inc.
Jean Marie Klebetz of Spring Valley, NY passed away on Sunday, November 4, 2018 at The Joe Raso Hospice Residence, New City, NY. She was 88. Mrs. Klebetz worked as corporate secretary for Cosco Industries in Spring Valley, NY for 20 years before retiring. Jean Marie was born April 19, 1930 in Suffern, NY to William and Eugenia (Polhemus) Kearney. She was educated in Pearl River and was a graduate of Pearl River High School in 1948. She attended New York College and also Catherine Gibbs Secretarial School. Jean Marie will be remembered for the love of her precious dog Holly and her many dogs prior. 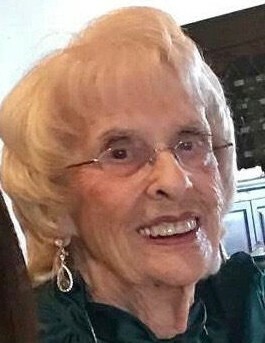 She is survived by her daughter, Jeanne Noonan and husband, Ed of Monroe, NY; sons, John Klebetz and wife, Shirley of PA and Robert Klebetz and wife, Patty of Nanuet, NY; grandchildren, Kristin and Craig; Nicholas and Robbie; and Timothy, Kaetlyn and Stephen; great grandson, Ryan Noonan; brother, William Kearney, sister, Margaret Dreyer and brother, Robert Kearney. She is predeceased by her husband, Stephen (2011) and her parents. A Mass of Christian burial will be celebrated 11:30 AM Wednesday at St. Anthony R. C. Church, Nanuet. Burial to follow at Frederick Loescher Veteran Cemetery, New Hempstead, NY. Visiting is Tuesday from 7 to 9 PM and Wednesday from 9:00 to 11:00 AM.